When I was in my early teens my dad came back from a trip to south africa with a bunch of french culinary magazines for me. I was elated, oh so many new tasty things to pour over, this was of course before the internet was so full of the information it is now. Back when BBS stuff was more the norm. I know, I’m a fair bit aged. I came across a recipe that was called potato surprise that just sounded oh so tasty…and it was. It was the first time I had come across a stuffed potato and I was in love. Years later, driving across the country with my husband I encountered another version of the stuffed potato that made me raise an eyebrow in Alberta. Served in this amazing steakhouse was a spiced potato surprise. I have been adding a kick of spice to them ever since. Now that things around here are a bit lighter I have had to re-imagine my potato surprise and you know what? It is still awesome. Oh potato surprise, you never let me down. Clean, dry, stab the potatoes with a fork 6 times. Bake at 350F for 1 hour. Sure, you can do them in the micro but I hate the texture you get when that is done. Bleh. Carefully slice the potatoes in half and allow to cool enough that you can handle them safely. Scoop out the insides of the potato leaving about a centimeter of flesh still attached to the skin. Reserve the potato flesh in a bowl. Place the skins on a baking sheet. 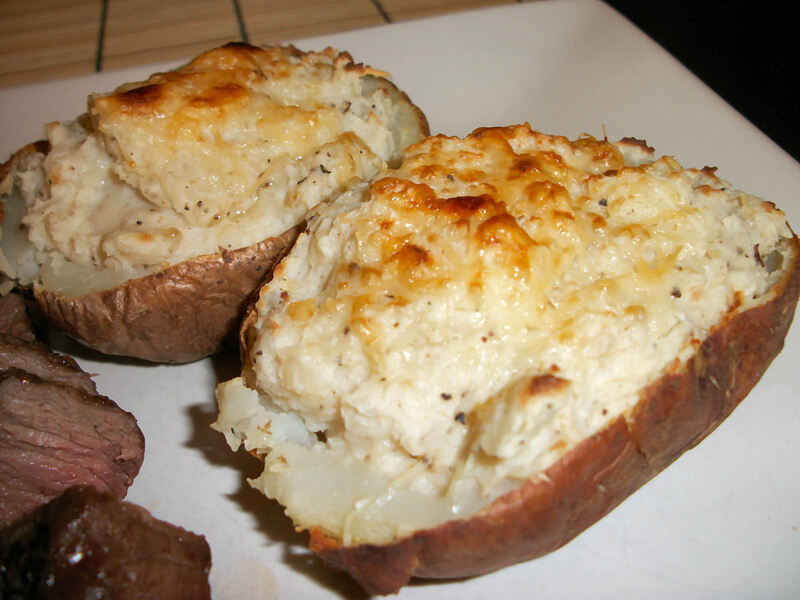 Add the sour cream, spices, and half the cheese to the potato flesh you reserved. Mash until smooth and creamy (this happens best if the flesh is still warm when you are working with it). If you want to get fancy get out the mixer and whip. Spoon the mixture back into the potatoes (or if you are being fancy pipe them back in). Top with the remaining cheese. Place back in the oven at 350F for 20-30 minutes. Serve. Makes 4 servings (1 half a potato). Each serving contains 191 calories, 3.1 grams of fat, 34.3 carbs, 3.3 grams of fibre, and 7.3 grams of protein. It’s definitely a filling special occasion side dish. The work involved really isn’t much considering it can be broken up. I tend to bake and stuff the potatoes before hand and then do the final baking step right before serving. They work out just fine if you make them the night before. Great for serving to guests. This entry was posted in Sidedish and tagged Cheese, Potato, Sour Cream. Bookmark the permalink.